Depression, bipolar disorder, and anxiety disorders exact a significant toll on individuals and society in terms of human suffering, lost productivity, high health care costs and more. The Institute of Living is seeking philanthropic support for a groundbreaking initiative with the potential to address these issues. It’s called the Depression Initiative. 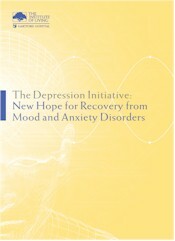 The Depression Initiative is aimed at enabling people with depression, bipolar disorder or anxiety disorders to achieve not just improvement, but full, functional recovery. The Depression Initiative will develop innovative clinical and research programs to advance the global medical community’s understanding of these disorders. It will develop state-of-the-art treatments tailored to each patient. And it will make The Institute a national Center of Excellence in mood and anxiety disorders. Click here to download the brochure which describes the initiative in more detail. 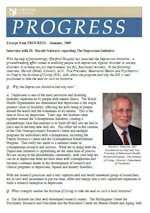 Click here to read the PROGRESS interview with Dr. Harold Schwartz regarding The Depression Initiative. The Institute’s Depression Initiative represents an opportunity for individual and institutional donors to support an undertaking that will expand scientific knowledge, relieve human suffering and provide far-reaching social benefits. A variety of naming opportunities will recognize donors’ commitments to this important undertaking. The Institute of Living is one of the world’s premier psychiatric institutions. Respected for excellence in research, clinical care and responsible stewardship of resources, The Institute is both the ideal choice to mount this initiative and a worthy recipient of philanthropic support. Provide improved access to care for the growing number of people who need treatment but lack the financial means to obtain it. The Institute is seeking at least $3 million in individual, corporate and foundation support to achieve the goals of the Depression Initiative.